If you need barcodes for Amazon, you’ve come to the right place. To sell your products on Amazon.co.uk or Amazon.com, you need a barcode number to use as a unique identifier for your product. Our Barcodes are ideal for this. In fact they are exactly what you need. With Amazon, if you are storing and dispatching the products yourself, you don’t need to put the barcode image on to your product (but you can if you wish to). However, if you are using the Amazon warehousing & dispatch arrangements (Fulfillment by Amazon), you should put the barcode image on to your product. And remember we provide the EAN barcode number for free with every UPC Barcode order. If that’s not enough, we also provide all the artwork. What more could you want? Buy barcodes for Amazon now and start listing your products for sale via Amazon Seller Central. Look at the bottom of this web page for the links to our how to guides. One of them shows how to list products for sale on Amazon. It is a step by step guide and also shows a few tips and tricks to. So its perfect for a complete beginner or even someone who has been selling on Amazon for a long time. Amazon is undoubtedly one of the largest market places online. And if you want to sell your products online, it’s certainly one of the best platforms available to showcase them. If you decide to go down the Fulfillment by Amazon route, we can also help with that. 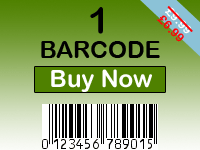 We offer a barcode label printing service, which also includes the printing of Amazon FNSKU labels / Amazon FBA labels. Also, on our website, we feature some products that were listed on amazon using barcodes supplied by us, why not take a look here. Alternatively if you have used our barcodes to list your product and want us to feature it on our website, please let us know by using the Contact Us form.